I visited Copenhagen for the first time in 1972. My mother, sister and I stayed in hotel Esplanaden, at the end of the the impressive Bredgade leading from Langelinie to Kongens Nytorv. 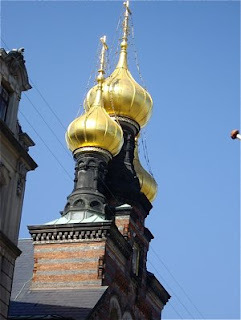 We had a room facing the towers of Marmorkirken and the golden domes of the Russian Orthodox Alexander Nevskij Church, a strange and exotic silouette on the Copenhagen skyline. It was a wonderful sight for a little boy as me. As I walked down Bredgade April 23rd 2008, I stopped to admire this beautiful building once again. 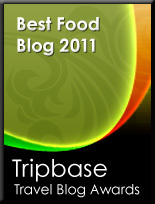 Here is a little bit of its history. The church is dedicated to Prince Alexander Yaroslovich Nevskij of Novgorod and Vladimir in Russia born 1220 and died in 1263. Alexander Nevskij is regarded as one of the key figures in Russian medieval history and was recently voted the greatest Russian that has ever lived beating the infamous communist dictator Stalin. There are a great number of other church dedicated to this saint, the most famous being the main cathedrals in Sofia, Tallinn, and churches in Belgrade and Tbilisi. The Danish royal family was closely linked to the Russian Tsars in the late 19th century. Princess Dagmar of Schleswig-Holstein-Sonderburg-Glücksburg and Denmark (26 November 1847 - 13 October 1928) married Tsar Alexander III of Russia in 1866. The tsarina known as Maria Feodorovna was the mother of Tsar Nicholas II of Russia, killed by the communists together with family in Jekaterinburg in 1917. Her father-in-law Tsar Alexander II was killed by a bomb on the morning March 13th 1881, making her the Empress of Russia. 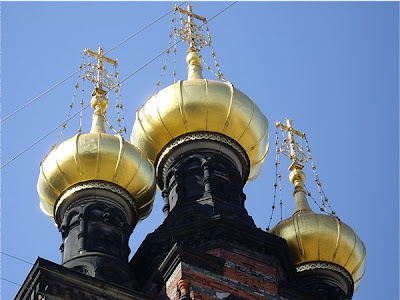 The official crowning took place in 1883, the same year the Alexander Nevskij church in Copenhagen was finished. 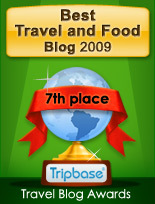 It was designed by David Ivanovich Grimm, a famous Russian architect and educator. Later in 1883 Tsar Alexander and Tsarina Maria, and their daughter Grand Duchess Xenia Alexandrovna travelled to Copenhagen to be present at the consecration of the church. 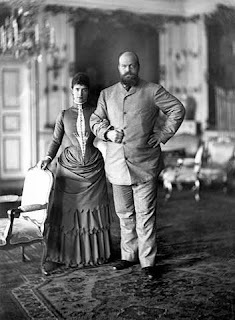 Her son Nicholas became tsar in 1894 when his father died, and Maria stayed in Russia until 1919, when she went into exile in Copenhagen. She died in 1928 and her ashes were buried in Roskilde Cathedral, the burial church of the Danish royals. In 2006 her ashes were removed from Roskilde to be brought to rest by her husbands side in Peter and Paul Cathedral in St. Petersburg. Back then there was a honorary procession that took her ashes to the Alexander Nevskij Church on her way back to Russia.